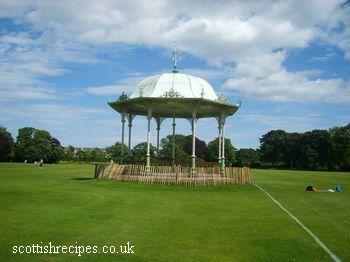 Duthie Park was gifted to the City of Aberdeen by Lady Elizabeth Duthie of Ruthrieston in 1881. Lady Duthie wanted to create a public park in memory of her uncle Walter and brother Alexander Duthie. She purchased the estate of Arthurseat by the banks of the River Dee for £30,000. A street called Sycamore Place was demolished to make room for the building and landscaping. 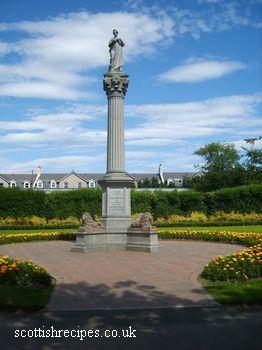 The lay out of the Duthie Park Aberdeen was designed by the surveyor and architect Mr William R McKelvie of Dundee. It measured 44 acres. The first turf was cut on the Saturday 27 August in 1881 by The Earl of Aberdeen Lord Lieutenant of the County and Lady Duthie with a silver spade and the original polished oak wheelbarrow used in this ceremony is still on display in the Winter Gardens. There were over 1000 people at the ceremony and 300 people were invited to a buffet inside a huge marquee. This included the Lord Provost Mr Peter Esslemont and the Rev. J. Mitford Mitchell. The park was formally opened on 27th September 1883. It was hoped that the Duthie Park Aberdeen, Scotland would be opened by Her Majesty the Queen but she was recovering from an accident. Princess Beatrice was in Aberdeen City where she was opening the Sick Children's Hospital Bazaar at the Music Hall and so she officially performed the opening. The Duthie Park Winter Gardens were opened in 1899 and in May 1969 the original Winter Garden was demolished for reasons of safety after sustaining damage in a gale. They were also called the Palm House and the original architect was Mr Rust. 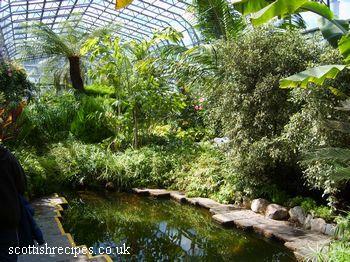 The original Winter Gardens were built from St Petersburgh redwood at a cost of £1550. It measured 108ft in length by 56ft in depth. It had a circular dome which measured 24ft in diameter and rose to a height of 46ft. Follow us on Twitter, Facebook, and Instagram. 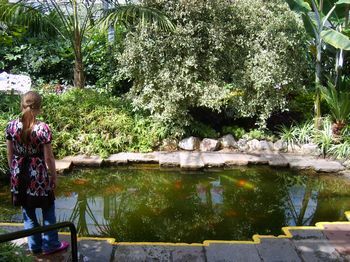 The current Winter Gardens were opened on the 9th April 1970 by Lord Provost Lennox and several extensions, like the fern house, corridor of perfumes and the temperate house have since taken place. This first new building cost £56000. 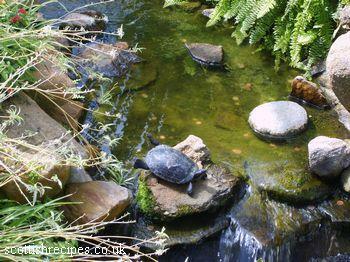 Now the Gardens are considered one of the largest covered gardens in Europe containing a wide range of plants and collections set amongst some stunning pools and goldfish. So much so that many newly weds come especially to have their wedding photographs taken in this beautiful backdrop. David Welch, a Director of the parks of Aberdeen, died in 2001. 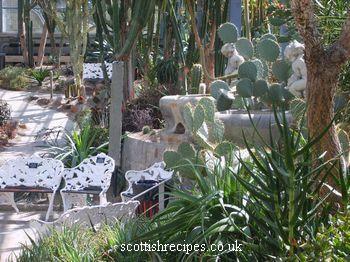 In his honour the Duthie Park Winter Gardens were renamed The David Welch Winter Gardens. A memorial courtyard to David Welch within the Winter Gardens and remains a quite place for many an Aberdonian and visitor. 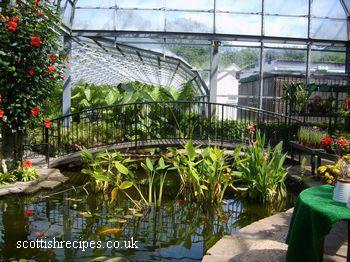 The David Welch Winter Gardens are the third most visited Gardens in Scotland. It now sells houseplants and gifts in a shop at the Fern House by the jumping frog in the pond feature and the public toilets. Weddings and wedding photography can take place against the stunning background and within the David Welch Winter Gardens. Also contained in this area is the Tropical House containing South American plants such as the Bromeliads, Orchids, Gingers and Aroids. The Temperate House has plants from Australia, New Zealand, the Mediterranean and South Africa which includes Eucalyptus, Callistemon, Protea, Leucadendron, Acacia, Phormium, Olive and Strelitzia. The adjacent Floral Courtyard has a display of Burma Star Association commemorative roses. In June 1995 the Victorian corridor was reopened after extension work and now contains a variety of stunning hanging baskets and pot plants such as Cyclamen, Pelargoniums, Fuchsias, Cinerarias and Calceolarias. 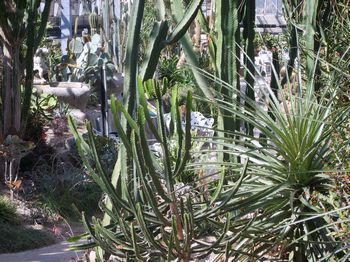 The Arid House holds a collection of Cacti from around the world such as South, North and Central America, Africa, Arabia and Madagascar. The Japanese Gardens are a place of peace and tranquillity and were opened in June 1987 to commemorate Aberdeen's condolences on the 40th anniversary of Hiroshima. They were designed by Takashi Sawano the Japanese landscape architect. 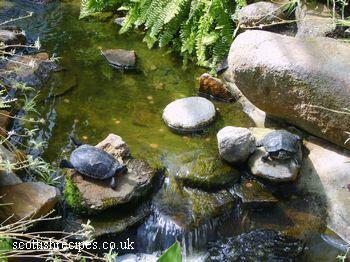 The terrapins and turtles live happily within the stream in the hot house. As you can see in the photo below they enjoy sunbathing. Spike the Talking Cactus returned to the Duthie Park Aberdeen Winter Garden in August 2011 after being away for about a decade after his mechanism broke. The Friends of Duthie Park organised his return. Spike the Talking Cactus joins McPuddock the frog. The Rose Mountain, designed on the old flagpole mound, contains a stunning summer display of over 120,000 roses. A mass of crocuses and daffodils provide spring interest and colour. A commemorative plaque for Lady Elizabeth Crombie Duthie was unveiled at her former home of 34 Maberley Street by Berryden in honour of her generous bequest that has benefited so many. 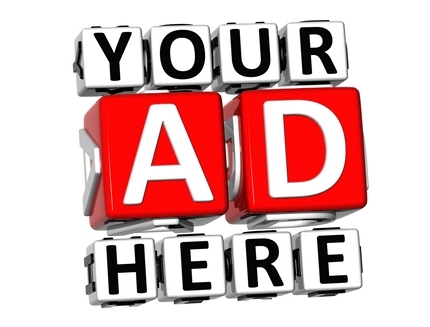 Advertise on Scottish Recipes Website, Facebook and Twitter Pages from just £75. The Victorian band stand is a central feature on the large grassed area. It has been preserved throughout the years and modern additions include the addition of power for modern musicians. There's so much to do after admiring the gardens. There are boating ponds and a pond for sailing model yachts and remote controlled boats. These make super walks and there are many birds on the pond to feed. 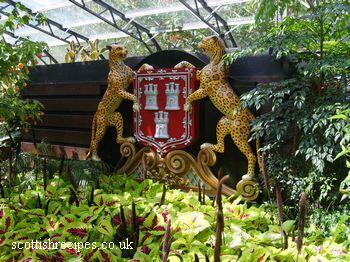 Children will enjoy the swings, large chutes and some clever woodcarvings to climb on and pose for photos. The large grassed area is great for running around, kicking a ball, throwing a frisbee and so much more. At the rear of the park is a bowling green and tennis courts. In the centre of the park lies the elegant Victorian Band Stand. There is a Swan Fountain by the children's playground. This was donated by Miss Duthie. There is a restaurant where a refreshing drink and cake can be enjoyed and serves lunches at reasonable prices - their stovies is a must to try, as is their hot chocolate. It lies on Polmuir Road. The Gardens are open from 9.30am, 7 days a week and closes on Christmas Day and New Year's Day. Admission is free, but donations are welcome. 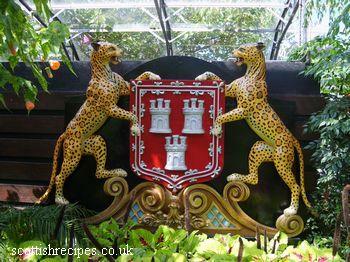 The Global Aberdeen Plant Trail opened in March 2008 in the David Welch Winter Gardens. The Global Aberdeen Plant Trail represents the 30 Aberdeen places around the world which were visited by Fred Bull of Logie Coldstone. He then wrote the book Aberdeens Around The World. The Global Aberdeen Plant Trail has a collection of plants from these towns and cities which include countries such as Africa, Australia and Antigua. Lord Provost Peter Stephen opened the Global Aberdeen Plant Trail. It is a great place for children to enjoy a Teddy Bears Picnic. Recent events included the Friends of the Special Nursery, the babies from the neonatal unit of Foresterhill Hospital who held a Teddy Bears Picnic on the 29 July 2007 from 2 - 4pm. Children's entertainment included a magician, face painting and children's refreshments. North East of Scotland companies took part in an It's A Knockout competition at the Duthie Park in Aberdeen in July 2007. Contestants played games, much like the popular television series, with inflatable's and water obstacles courses whilst wearing fancy dress and inflatable and padded suits. The It's A Knockout was a charity event held throughout Scotland and the UK to raise funds for the charity Epilepsy Action. Other events included the VSA Fundraising Day (Voluntary Service Aberdeen) on Sunday 20 May 2007 from 10am to 4pm. This marked the first fundraising week for the VSA. The family fun day included bouncy castles, stalls, fairground rides and food and drink stalls. The highlight of the day was a Suspended Catch Air Device (SCAD) Sky Dive by the chief executive of VSA, Mr Kenneth Simpson. This involved him jumping backwards from a 200ft high platform wearing a special harness wear he free fell 150ft at up to 70mph before landing in a special double net that has protective air tubes that is 50ft from the ground. About 70 other people took part in the SCAD Dive to raise about £5000 for the Voluntary Service Aberdeen. The Duthie Park took part in the Great Wee Walks of 2007 where children, their teddy bears and their parents took part to raise funds for charities. It was aimed at primary school children and they had to walk 2 miles. Four Great Wee Walks took place at hourly intervals from 11am. The school pupils also enjoyed the extra fun of hopscotch, music, dancing, hula hoops and skipping. The mascot of the Great Wee Walks for 2007 was Scotty, who enjoyed walking with some of the children. Scotty represented the Great Scottish Walks Charity. In the summer of 2007 the Heritage Lottery Fund sent technical experts as part of an assessment for a £7 million plan to upgrade the area. They revisited in the autumn of 2007. Duthie Park remains in the top five attractions in Scotland and Aberdeen Council hope to renovate the attraction for the enjoyment of the hundreds of thousands of people who visit it each year. Financial estimations consider that £7,378,282 is needed for the project. It is hoped that £4,990,482 will be granted from the Heritage Lottery Fund from the Urban Parks Programme whilst Aberdeen Council will contribute the remaining money. Funds will be spent on improving the model boat pond to make it larger and deeper for modern model boats and even submarines. The ponds with their leaks are hoped to be repaired, paths and railings renovated and a new car park built. Other improvements suggested are the replacing of the tennis courts and the bowling green with a horticultural pavilion and replacing the curving path of the Rose Mountain and restoring the plinth and flagpole. It is hoped that this could then be used on special Scottish and Aberdeen days to fly the Saltire such as on St Andrew's Day. It is anticipated that such work would be finished by the autumn of 2010. In December 2010 it was awarded £2.56 million from the HLF (Heritage Lottery Fund) from the Parks For People fund. Aberdeen Council funded £2.67 million towards the £5.38 million redevelopment of Duthie Park Aberdeen. Work is hoped to now commence in 2011 with plans to give the three linked boating lake a makeover and to raise the rose mound to its original height. A major event was the Queen's Golden Jubilee celebration for Aberdonians on May 2002 for Her Majesty Queen Elizabeth the Second. On the 1 August 2007 another major event was the centenary celebrations of the Scouting movement. Aberdeen scouts celebrated their 100th anniversary at 8am with a pancake breakfast. 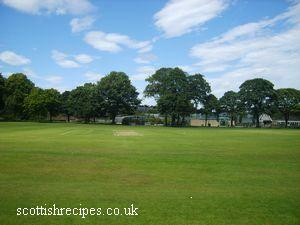 Here is more about the history of the Aberdeen Duthie Park in addition to what is written at the top of this Scottish Recipes review. Grounds by Albyn Place with surrounding areas of Cuparstone Road, Union Grove and Bleachfield Road. Referring to our recent conversation on the subject of Miss Duthie's desire to do something for the benefit of the City, I am directed to offer £1456 12s 5d for the property near Allenvale belonging to the Town Council, being the price at which they purchased it from Mrs Allan's Trustees, subject to a feu-duty of £61 3s 4d. The Lord Provost was keen for Miss Duthie to buy nearby Arthur Seat so that Aberdeen shall have a park which, for eligibility and picturesqueness and beauty, will not be exceeded by any park, I would almost say, in Scotland. Arthurseat had belonged as a life-rent to Doctor Benjamin Williamson and after his death it belonged to his son Mr Arthur Steuart Williamson who emigrated to Australia in 1857. Though he wrote home to Aberdeen regularly his letters stopped in the year 1863 and nothing further was heard from him or about him. An Aberdeen advocate, Mr Alexander Edmond, was appointed his factor loco absentis in 1875 but had no authority to sell the land of Arthurseat to Miss Duthie. So Aberdeen Council requested Parliament make a compulsory purchase order with the intent of creating Duthie Park. This was duly granted and the Aberdeen Corporation Act that was passed in spring 1881 included the agreement between Miss Elizabeth Crombie Duthie of Ruthrieston and Aberdeen Council and that it would be upheld and maintained under the provisions of the Public Parks (Scotland) Act 1878. ...I shall be glad if, in the records of the town and the memories of the inhabitants, the names of Walter and Alexander Duthie are preserved as true benefactors of the native city. Used 27 August 1881, on the occasion of Cutting the First Turf of the Duthie Park, gifted to the Town of Aberdeen by Miss Elizabeth Crombie Duthie of Ruthrieston. The barrow was made by cabinetmaker Mr T Baird from polished oak and the Duthie family arms was carved on a panel over the wheels with the family motto of Data Fata Secutus. After the first turf was cut Miss Duthie ceremoniously handed the title deeds to Mr Murray who then passed them onto Lord Provost Esslemeont on behalf of the Aberdeen Town Council. A book about the Duthie Park Minute of Thanks was specially made and presented to Miss Duthie. It had gilt scroll work and bound in red morocco. Work swiftly started on creating the Duthie Park and the surveyor, Mr Alex Murray employed Messrs P Bisset and Son for the building work of the houses (such as the lodges for the keepers and gardeners) and walls, Messrs Abernethy and Co for the ironwork such as the railings and gates, Messrs Blaikie Brothers for water iron pipe work, Messrs James Buyers &Co as carpenters and Mr James Farquhar for plumbing work. The Keeper of the park was Mr Harper. Messrs A Macdonald & Co constructed a fountain. It was raised about 12 feet from the ground and was made from Peterhead granite. It had three basins with the lowest being 22 feet. It had an intricate carving of four swans with outstretched wings and curved necks with their bills resting on their breasts. The water for the fountain was jetted from the bills into the pool below. In Commemoration of the Advance of Temperance under the auspices of the Aberdeen Temperance Society in the year 1882. "Thou gavest them water for their thirst." Neh, ix, 20. The main walk around the Duthie Park may seem to have broad paths but this was intentional so that in the olden days horses and carriages could driver around the path so that passengers could enjoy the scenery. At the opening of the Duthie Park the drive path was 2 miles in length whilst the walk paths were 5 miles long. 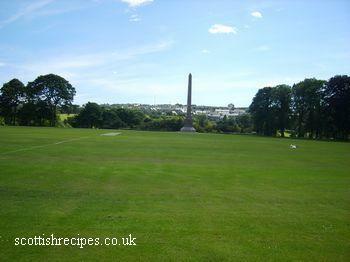 The opening ceremony of the Duthie Park took place on 27 September 1883 and this day was declared a local holiday. Her Royal Highness Princess Beatrice left Balmoral Castle for Aberdeen by taking a coach to Ballater where she boarded a special train. She was attended by Lady Southampton, Colonel Maude and Major Edwards. She arrived at Aberdeen at noon where she was driven to the Music Hall to open a bazaar in aid of the Sick Children's Hospital and then she dined at the Imperial Hotel, Stirling Street with a special lunch reception. Princess Beatrice was then driven via Regent Quay and Marischal Street to the Town and County Buildings where there was a meeting with the Corporation with noblemen and gentlemen. Then there was a procession to Union Street and Crown Street to the Duthie Park where she took part in the opening ceremony before departing in a train which had specially been connected to the grounds complete with platform. Men from the Gordon Highlanders formed a guard of honour under the command of Captain Pain and Lieutenant Jennings_Bramwell at the railway station whilst the 1st Aberdeen Rifle Volunteers were the guard of honour and the crew of HMS Clyde lined the streets. Many groups and organisations took part in the procession to the Duthie Park. They wore full regalia, emblems, banners and jewellery and included Mason Lodges, Practical Gardeners, Operative Tailors, Aberdeen United Trades' Council, Combmakers, Members of the National Independent Order of Oddfellows, The Ancient Order of Foresters, The Rose and Thistle Lodge of Free Gardeners, Independent Order of Good Templars, Carters and Lorrymen. Admission to the opening ceremony of the Duthie Park was by ticket and 8500 were given over to the general public. People queued at the Town House and police had to be present to control the crowd wanting tickets which were given out within the day. Many who queued did not receive a ticket. 400 Grand Stand tickets were given to Miss Duthie. Her generosity to the people of Aberdeen continued when she donated £100 for fireworks so that a pyrotechnic display could be set off at Wellington Suspension Bridge. Princess Beatrice was presented with a souvenir silver key made by Messrs M Rettie & Sons Jewellers. The silver key had three rings and each had a separate significant engraving which were the arms of HRH Princess Beatrice, the arms of the Duthie Family and the motto Bon-Accord. This key to the Duthie Park was presented to Princess Beatrice by Miss Duthie. The same jewellers also made a silver spade which Princess Beatrice used to plant a memorial tree. The silver spade was formally presented to the Princess afterwards. It was engraved with a thistle and was of dark oak that had been French polished. The shaft had a carving of more Scotch thistles. On the front of the silver spade was engraved the coronet of Her Royal Highness Princess Beatrice. Beneath this was the HRH arms on a lozenge shield. In 1976 the popular BBC TV children's program Playschool came to Aberdeen. Playschool broadcast a special television program from the Duthie Park in Aberdeen. Playschool presenters Carol Leader and Stuart McGugan entertained Aberdonian kids whilst the BBC outside broadcast unit filmed the event for nationwide screening. Local Aberdonian artist Jimmy Sutherland has painted a stunning picture of the Duthie Park which is for sale as an art print. It has views across the boating pond with the foliage, flowers and walkway. It is available to purchase from £6. A mounted art print costs from £12 whilst framed art prints and other views cost from only £22. Stockists include the P&J and EE shop at 170 Union Street which can be found next to the Music Hall. Other art prints from Jimmy Sutherland include the His majesty's Theatre, Johnston Gardens and views of the Bridge of Dee painted from the rear of the car park. Elizabeth Crombie Duthie lived at 34 Maberly Street, Aberdeen. In 2005 a plaque was erected there in her memory. The building was demolished in 2008 and 12 luxury flats were built in its place. The plaque was replaced at the site. An Elizabeth Crombie Duthie painting that had been restored was unveiled in the summer of 2008 by Lord Provost Peter Stephen during the 125th anniversary celebrations. The artist was James Coutts Michie who completed the artwork in 1885. To celebrate the 125th anniversary of the Duthie Park there was a special Victorian event held on Sunday 14 September 2008. The great, great, great niece of Miss Duthie, Jackie Leith, dressed in period costume to make her look like her relative and greeted visitors at the gate. Victorian entertainment included an organ grinder, actors dressed as Queen Victoria and her Ghillie John Brown, a Victorian model railway and a model boat regatta. Site contents copyright © ScottishRecipes.co.uk 2004-2019 - All rights reserved.